There are many different asset classes to choose from. Of all the investment options out there, investors can buy individual stocks, bonds, or mutual funds that include a combination of these asset classes. In addition, real estate and commodities are investable asset classes. Over the past several decades, stocks have offered investors the highest rate of return among the major asset classes. Within stocks, investors can choose to buy individual stocks, or funds that hold a basket of stocks. Buying individual stocks could help investors generate above-average returns, but individual stock ownership also exposes investors to greater volatility. On the other hand, investors can purchase index funds, to mimic the broader market or a particular sector. There are multiple advantages and disadvantages to owning individual stocks or index funds. Ultimately, the best investment comes down to the investor’s specific goals and level of risk tolerance. The easiest way to invest in stocks is to buy index funds. These are balanced funds that hold a large number of stocks. Index funds are designed to mimic the returns of a chosen benchmark. The advent of exchange-traded funds, or ETFs, has opened up a whole new world of low-cost index investing. ETFs have similar features as mutual funds, but also provide all-day pricing, whereas mutual funds are priced once per day, at the end of the trading session. In addition, many ETFs have lower expense ratios than traditional mutual funds, which makes them even more popular for retail investors. For example, in the case of total market index funds, the SPDR S&P 500 Trust ETF (SPY) mimics the returns of the S&P 500 Index, the most common stock market index. There are many other index funds that investors can choose from. Index funds provide investors with exposure to the stock market, without the complications of performing research on individual companies. As you can see in the following image, the SPDR index fund’s holdings are almost identical to those of the S&P 500 Index. Individual stocks are purchased through a brokerage account or from a company directly. There are thousands of stocks to choose from, with a variety of different characteristics. Stocks can be classified in terms of market capitalization. There are micro-caps, small-caps, mid-caps, large-caps, and mega-caps. Stocks are also differentiated based on market sector. Just a few of the major market sectors include health care, technology, and consumer staples. Furthermore, some stocks pay dividends, while others do not. Shareholders of dividend stocks should understand a few important dates, such as the dividend declaration date, record date, ex-dividend date, and payment date. The major takeaway of this is that buying index funds removes some of the potential headaches that can come with buying individual stocks. The major benefit of index investing is diversification. Investors can instantly purchase an entire index, providing exposure to a huge range of stocks and market sectors, all at once. This helps reduce risk and portfolio volatility. Buying shares of individual companies is more complex. That said, there are benefits to investing in individual stocks as well. While many ETFs have low annual fees, owning individual stocks requires no annual fees at all. In addition, buying individual stocks could provide outperformance. For instance, an investor who buys shares of the SPDR index fund will essentially earn the market returns, less the annual expense ratio of the fund. Individual stock ownership could result in much greater returns than the market, if an investor proves to be a successful stock-picker. However, the other side of the coin is that individual stock ownership exposes investors to greater risks. Buying shares of an individual company means investors are placing their money in the hands of a single business operation. If the business performs poorly over the holding period, an investor can lose money. The worst-case scenario is that the company goes bankrupt—in which case, the investor could lose their entire investment. Buying multiple individual stocks can help mitigate the risk of individual stock ownership. Indeed, wading into the waters of individual stocks requires investors to conduct thorough due diligence before buying shares. Investors should consider all of the following topics before buying stock in an individual company—valuation analysis, financial statement analysis, economics, and geopolitics. For investors who want to invest in the stock market but are not interested in keeping up with all of these topics, index funds are the proper choice. Income investors may see particularly good reason to buy individual stocks instead of index funds. Income investors are those who prefer to receive dividend income from the stock market. Not all stocks pay dividends, and this is particularly true of technology stocks. Since the S&P 500 Index is heavily composed of a few large stocks that do not pay dividends, such as Alphabet, Amazon, Berkshire Hathaway, Facebook, and others, index funds that use the S&P 500 as a benchmark have fairly low dividend yields. For example, the SPDR index fund has a current dividend yield of just 1.7%. 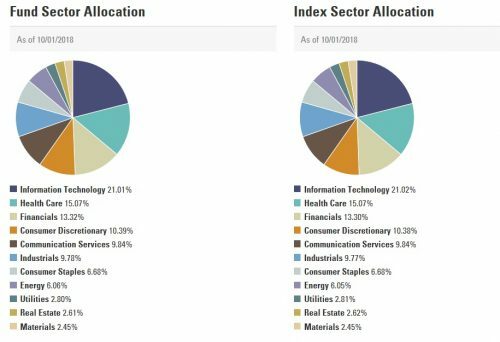 The Information Technology sector currently represents more than 20% of both the S&P 500 Index, and the SPDR exchange-traded fund. For investors who desire a higher level of investment income, such as retirees, index funds may be somewhat disappointing. Interest rates remain low, which means high levels of investment income are hard to find. The stock market can be a suitable place for income investors, because many stocks have dividend yields of 2% to 3%, or even higher in some cases. But because of the disproportionate size of non-dividend paying stocks within the S&P 500, index funds do not provide high levels of income. This is where owning individual stocks can be particularly advantageous. It is not very difficult to find stocks with significantly higher dividend yields than index funds. Consider the list of Dividend Aristocrats, a group of 53 stocks in the S&P 500 that have raised their dividends each year for the past 25+ consecutive years. Many Dividend Aristocrats have strong business models and powerful brands, such as Walmart, Johnson & Johnson, and 3M. These three stocks have dividend yields of 2.2%, 2.6%, and 2.5%–all significantly higher than the S&P 500 average. Investors could create a portfolio of high-quality dividend stocks, which would provide diversification as well as a higher level of portfolio income. Both index funds and individual stock ownership have their merits, and appeal to different types of investors. Ultimately, it might be a good idea for many investors to incorporate a mix of both into their investment strategies. Those looking for a quicker way to invest for maximum diversification and fewer potential complications should pick index investing, while investors interested in generating above-average returns or higher dividend income should favor individual stocks. Exclusive Bonus: Before investing in index funds check out our exclusive index funds picks. Should Investors Buy Individual Stocks or Index Funds?